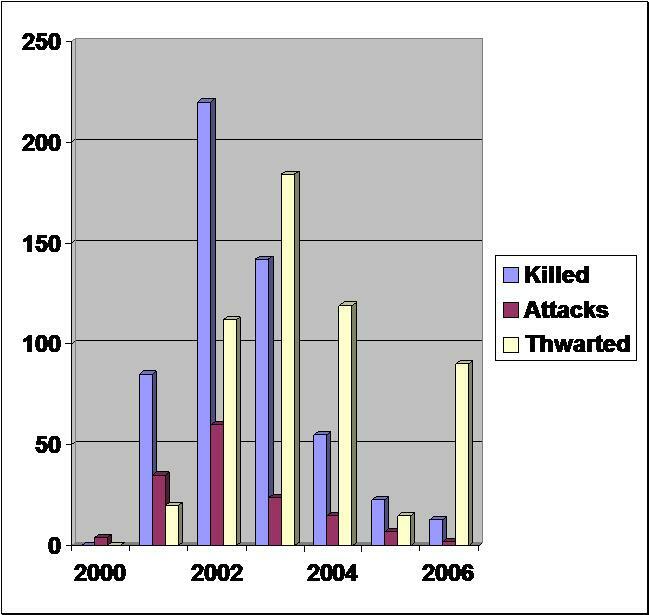 2006 Sees Drastic Increase In Palestinian Suicide Terror Attempts……. – The Tundra Tabloids……. 2006 Sees Drastic Increase In Palestinian Suicide Terror Attempts……. 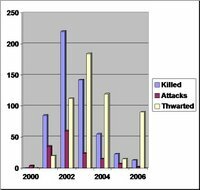 An article describing the increase in Palestinian suicide terror attempts in 2006 (90 so far), brings an important and interesting issue to the forefront. What would the perception of the Palestinian/Israeli conflict be, if one were to figure in the number of failed Palestinian suicide bombing attempts, with the actual averaged number of Israeli citizens killed per bombing attack during the last 5 1/2 years? In other words, what if the IDF was consistantly unsuccessful in thwarting Palestinian suicide bombing attacks? It is exactly this disparity in numbers that are being used as proof by the Palestinians and their sympathizers, that the Israelis are the chief aggressors in the ongoing conflict. By multiplying the average number of Israeli victims murdered by Palestinian suicide bombings over the past five and a half years, with the number of attempted (failed) attacks (4.2 X 540). Then add the number of these potential victims (2277)with the number of the already murdered (1084),and you’ll have the number of Israeli dead (3361), with the overwhelming majority being civilians. Roughly 4000 Palestinians have died in the 5 years of fighting since Sept. 2000, with the ratio being 3.5:1 in terms of Palestinians killed vs. Israelis. The proportion of armed vs. unarmed Palestinians killed is “roughly” 2:1, while Israel commands a 100:1 ratio in terms of military strength vis-a-vis the Palestinians (majority killed during the Intifada were armed fighters)proves without a doubt that Israel is very careful in whom it targets and the extreme difficulties involved in managing a low level conflict against an enemy that cynically uses its own people as shields. Previous Post Previous Post Saddam Hussein’s Taliban Connections……. Next Post Next Post Hamas Threatens Gaza Journalists…….